creation in its various forms has been put on hold for the time being. i moved to michigan on monday, but only to the temporary house we are renting until our house is available in mid-august. we are trying to buy minimal groceries, and leave as many boxes packed as possible, until we move into “our” house. so, i am waiting to buy things needed for kitchen creation (flour, sugar, vanilla, spices, etc. ), and most of my other hobbies are packed up. no crocheting, painting, etc. for awhile. i also haven’t started my assistantship yet, so i am feeling somewhat restless and as though i am in limbo. 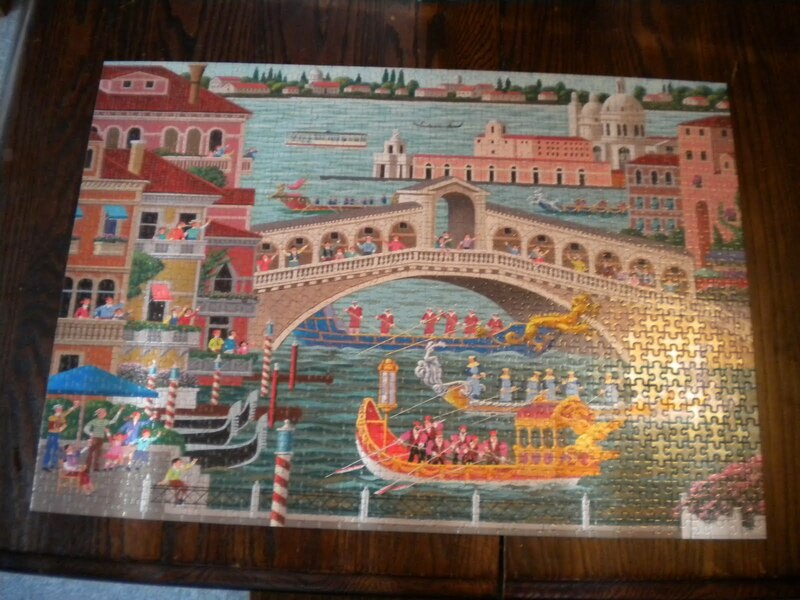 for some reason, i had an intense craving to do a jigsaw puzzle the other day. so, mike and i bought a couple and finished this 1,000 piece puzzle earlier tonight. it is not technicaly my “creation” but hey, we assembled it, so that counts for something, right? in any case, the next time i complain about my terrible attention span, remind me of the five hours i sat working on this last night! This entry was posted in Fun Stuff and tagged fun stuff, jigsaw, puzzle. Bookmark the permalink.